Boise State: The Broncos, 11-3 last year, are favorites to successfully defend their Mountain West title. They have fourth-year starter at quarterback in Brett Rypien, the nephew of former Super Bowl MVP Mark Rypien, and return nine starters on defense. 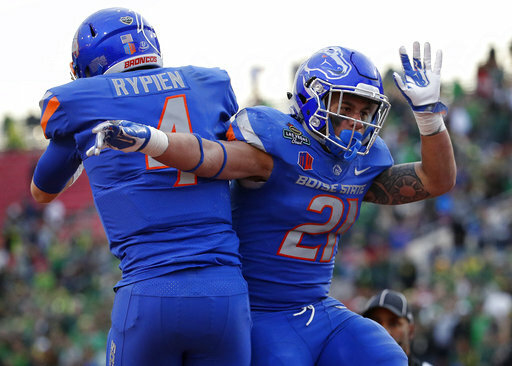 Boise State’s nonconference schedule, however, isn’t easy, with trips to upset-minded Troy and Oklahoma State. Central Florida: The Golden Knights had a magical 2017, going 13-0, beating Auburn in the Peach Bowl and proclaiming themselves national champions. All that success had a price, because coach Scott Frost left to take the Nebraska job. Frost, however, did not leave a bare cupboard. The Knights return quarterback McKenzie Milton, who passed for 4,037 yards and 37 TDs last year, to an offense that averaged 48.2 points per game, tops in the nation. They’ll be favored to win the American Athletic title again, and the nonconference schedule is solid, with a trip to North Carolina and a visit from Florida Atlantic. Fresno State: Coach Jeff Tedford engineered a turnaround from 1-11 to 10-4 in his first year in Fresno, and his Bulldogs should be Mountain West title contenders again. They beat Boise State in the regular season last year before falling to the Broncos in the conference title game. Fresno State returns seven starters to a defense that allowed only 17.9 points per game in 2017, and the offense is in the capable hands of quarterback Marcus McMaryion, who went 9-2 as a starter. Trips to Minnesota and UCLA give the Bulldogs some heft in their nonconference schedule. San Diego State: If Fresno State doesn’t win the Mountain West’s West Division, then San Diego State likely will. The Aztecs, 10-3 last year, will rely on their usually solid running game, with junior Juwan Washington (759 yards in 2017) taking over for Rashaad Penny, the nation’s rushing leader with 2,248 yards last year. The nonconference schedule is daunting, with a season-opening trip to Stanford and a visit from Arizona State, but the Aztecs beat both those teams last year. Florida Atlantic: Lane Kiffin worked wonders in his Owls debut, leading the team an 11-3 record that included the Conference USA title and a Boca Raton bowl rout of Akron. Florida Atlantic returns 10 players on defense, while Devin Singletary (1,920 rushing yards, a nation’s-best 32 TDs) carries the offense. The Owls’ nonconference schedule is brutal. They open the season at Oklahoma and have a Sept. 22 trip to Central Florida. Memphis: The Tigers, 10-3 last year, pose the biggest threat to Central Florida in the American. Memphis nearly spoiled UCF’s storybook season in the AAC title game last year but fell 62-55 in double overtime. With eight starters back on both offense and defense, the Tigers have plenty of experience but will be breaking in a new starter at QB. A trip to Missouri highlights an otherwise-tame nonconference schedule. Ohio U.: The Bobcats averaged a school-record 39.1 points per game last year and appear ready to build on that. Quarterback Nathan Rourke passed for 2,203 yards and 17 TDs and rushed for 912 yards and 21 TDs, and Ohio returns a 1,000-yard running back in A.J. Ouellette. The Bobcats’ schedule features back-to-back September trips to Virginia and Cincinnati.